These are our two mascots who are coming on our travels. Jon has Charlie Brown (some sort of childhood fixation thing) and I have Rocky from one of my favourite films. Unfortunately Babs and the rest of the gang are making new friends in the charity shop. We have spent a couple of days getting our bearings and doing a lot of walking. We can make tea, coffee and snacks in our little garden room but the main kitchen facilities are in the Africa House. (This is another house rented out by our host Tonia). I has three double bedrooms, kitchen, utility room and a huge lounge diner. As well as some quirky African ornaments. We need a name for this young lady…. any suggestions? We have read up some of the history of Groesbeek and there was a massive contingent of Canadian forces here during September 1944 to liberate this corner of Holland and try and break through the northern end of the German front line. It was a combined allied assault. The British objective was Osterbeek (Arnhem) immortalized in the film “A Bridge Too Far”. 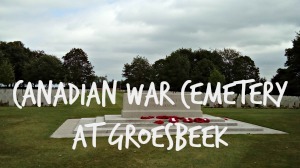 The local school children look after the Commonwealth Cemetery in Groesbeek and we walked through the woods to get there (and back via the local hostelry – The Old Windmill – de ouden Molen to us locals). As always, we wanted to find out more so yesterday we visited the National Bevrijdings Museum, again within walking distance. Four hours had passed before we realised. We were all historied out by then so it was back to the Africa House to make dinner. It has been very windy here for a couple of days but this morning we have beautiful clear blue skies. This picture was taken around 9am. No time like the present to get on the mountain bikes!! We are heading for Mook (pronounced Mock). Let us hope that Jon’s saddle is more comfortable than it looks. Saddle wasn’t all that comfy! Thanks for the update on “The Africa House”. I couldn’t get the idea of refugee centre out of my head, I am greatly relieved. As for the figurine, apologise in advance but the first name the came into my head was Ruth. Off to book a good therapist now. Ruth? Sounds reasonable. Not many refugees in the Africa House although think a party of 8 very excitable Dutch women are currently in the middle of a righteous party. No such thing as a comfy saddle….. We are enjoying following the adventure. Have fun. You’re right Trevor. Part of me knows in very unpleasant detail just how uncomfortable that saddle is. Getting used to it slowly though. We’re having the best time so far thanks.